This is a photograph of Glee S. Smith, Jr. who lived and practiced law in Larned, Kansas, and later Lawrence, Kansas. He was born in Rozel, Kansas, on April 29, 1921. Smith obtained his bachelors and law degrees from the University of Kansas and was a member of Delta Tau Delta fraternity. He served as a First Lieutenant in the Army Air Corps during World War II. Smith served twelve years on the Larned Board of Education and four years as county attorney. In addition, he served on many philanthropic and business corporate boards, including two life insurance companies and bank boards in other cities. 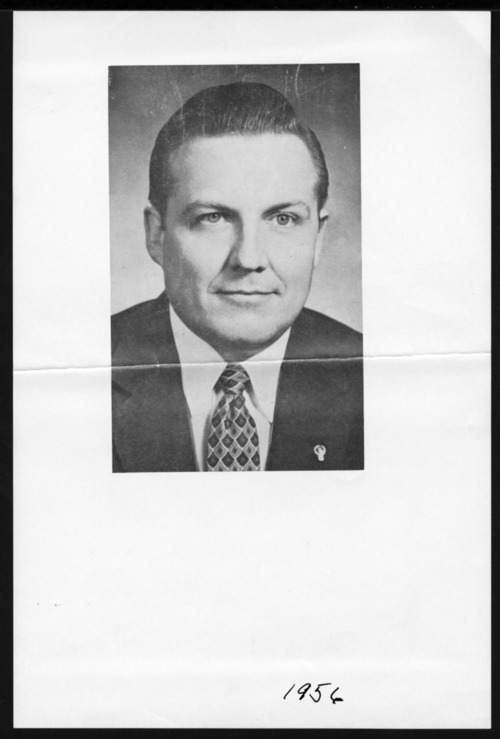 He served 16 years in the Kansas State Senate with eight years as President of the Senate. He later served on the Kansas Board of Regents. In 1975, he was appointed to the Board of the National Legal Services Corporation by President Gerald Ford. Smith served ten years as a member of the Board of Governors of the Kansas Bar Association and ten years as one of three Kansas delegates to the House of Delegates of the American Bar Association.